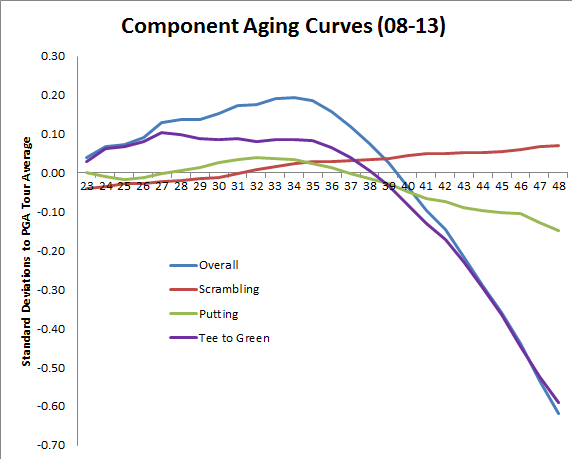 In the past months I’ve posted about aging on the PGA Tour several times, including a general aging curve and an aging curve for putting performance. 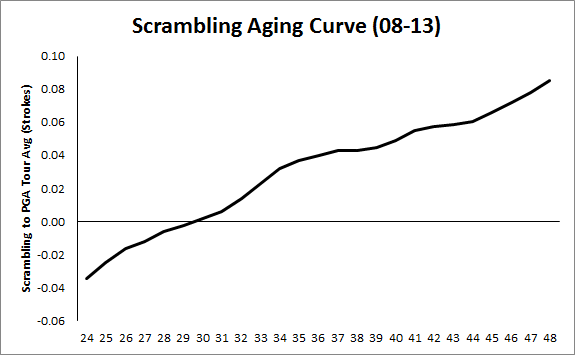 The general shape of the aging curve for PGA Tour players is a slight improvement from the early 20s to early 30s, followed by a period of relative stability through the mid 30s, and then a steady decline from the late 30s until 50. I assume from limited post-50 PGA Tour data and the paucity of Champions Tour golfers over 60 that aging continues to steadily erode a golfer’s game after 50. For putting, the curve was similar, but much less pronounced. Aging due to putting accounts for little of the improvement experienced in a golfer’s 20s and less than 10% of the decline experienced from the late 30s onward. The source of age-related improvement and decline is clearly some other part of a golfer’s game – either off the tee, the short game, or the long iron approach shot game. 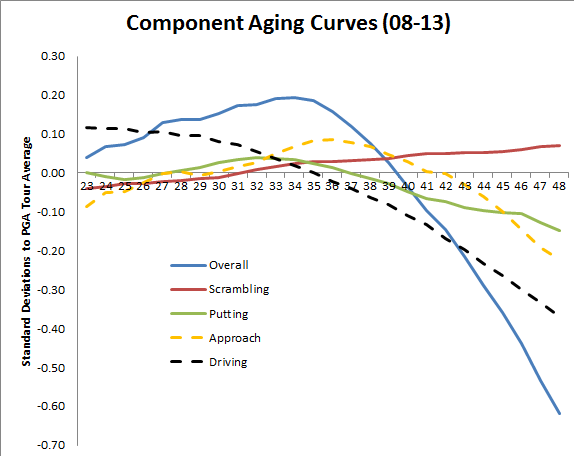 I’ve constructed aging curves for the first two components. I’ve calculated my own adjusted scrambling statistic previously which uses the PGA Tour’s scrambling stat as its base, but attempts to remove the influence of putting and difficulty of the lie to figure out which golfers play the ball into the best positions when they miss the green. I’ve described the calculation in this post. The spread in talent between the best and worst golfers each year by this metric is roughly a stroke. That is, the best golfers at scrambling gain half a stroke/round on the field and the worst golfers lose half a stroke/round. For comparison, the best putters gain nearly a stroke/round on the field and the worst putters lose nearly a stroke/round while the best golfers tee to green gain two strokes and the worst lose two strokes. Scrambling shots make up only 10% of a golfer’s strokes per round (6-8 strokes). Unfortunately, this method does not include strokes where a golfer went for the green in two on a par 5, but missed the green. I estimate these shots comprise only roughly 1.5 strokes/round for the average golfer, though as many as two strokes for longer hitters and as few as one for shorter hitters. These shots are no different than scrambling shots on par 3s or 4s (besides scrambling for birdie rather than par), but the data just isn’t there to include them. So around 15-20% of the sample of short game strokes is missing. I’m confident this will not materially affect the results of this study. I gathered data between 2008-2013 for which each golfer played consecutive seasons with at least 30 PGA Tour rounds. This resulted in 693 pairs of seasons to compare. As with prior aging studies, I used the delta method popularized by Mitchell Lichtman for use in baseball research. This method simply aggregates all improvements and declines between golfers at each age to see whether an age cohort generally improved or declined. From that data, a curve can be constructed. That is not even a curve, but instead a steadily increasing trendline. The data indicates that scrambling ability increases linearly with age. Golfers under the age of 24 (34 seasons since 2008) performed around 0.05 strokes worse than the field average at scrambling. From there, golfers improved by around 0.01 strokes/season – a small amount, but one that indicates that experience on Tour leads to improvement in short game play. This finding runs contrary to any other aging study I’ve conducted. I suppose it is not that shocking, however. Short game play involves a lot of technical skill – stance, position of hands, correct judgement of swing speed, club head position, etc. (in addition to strategy) – while not involving much of the physical strength that declines with age. Any golfer who can play on Tour can generate the proper amount of swing speed to play <50 yard shots. Not so much for the ability to generate the swing speed to hit 300+ yard drives or reach the green with 3 wood from 275 yards. Compare scrambling here with the other component curves I’ve introduced. Putting generally declines slightly, while tee to green play (meaning all non-putting/scrambling strokes) improves only until around 27, stagnates until the mid 30s, and then sharply declines. I’ll discuss why I believe tee to green play stagnates around 27 next. My catch-all category “tee to green” from above includes a wide array of shots: drives on par 4s/5s, tee shots on par 3s, going for the green shots on par 5s, long approach shots on par 4s/layups on par 5s, and short wedges on par 4s/par 5s. Some of those shots require a golfer to exert maximum effort to hit the ball near his peak ability (most drives/going for green shots), while most others require at least a full swing. In short, most of the shots contained in the “tee to green” bucket are going to be heavily affected by how much physical strength of golfer can exert. There are other factors certainly (strategy, precision, etc. ), but physical strength is a large part of it. The problem with that is the type of physical ability that combines body coordination with physical power – think driving a golf ball or hitting for power in baseball – begins declining as early as the mid 20s. This study from 2012 observed that while baseball hitters have tended to peak around 27, their ability to hit for power (home runs, doubles, etc.) has peaked at 25. I’ve observed the same phenomenon in golfers’ ability to drive for distance. To measure the impact of aging on driving distance I gathered the Trackman data the PGA Tour has from 2008-2013. Typically the PGA Tour sets up Trackman on one hole per tournament to gather information about the club head speed, ball speed, launch angle, carry distance, etc. for the drive. I prefer using this data to measure driving distance because it places all golfers on an even surface. The hole is selected for whether most golfers will hit driver and the carry distance measures only distance in the air (removing the effects of firm or soft fairways. I gathered data for all golfers with qualifying number of Trackman readings (>20/year) from 2008-2013 (the extent of the data collected by the Tour). I used the same delta method as above to measure the increase or decline in carry distance between consecutive seasons. That yielded 696 pairs of seasons. This indicates that a golfer’s peak driving distance performance comes from age 25 and earlier. Golfers out-drive the field by 6 yards before the age of 24, declining to roughly average by age 35, and then decline heavily from that point onward – losing almost 20 yards to the field by age 48. This is the exact pattern suggested by the baseball power hitting aging curve above. Now, at this point you may be wondering how a golfer can lose so much driving distance over the course of their career and still remain competitive. 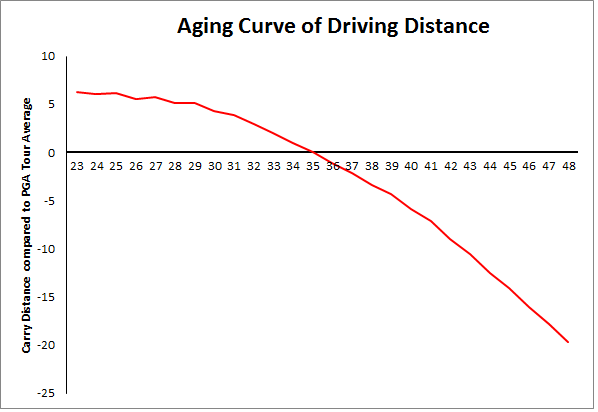 However, this aging curve doesn’t prove that every golfer ages similarly and it especially doesn’t mean that we should observe elite golfers losing so much distance. Elite golfers are elite because they have overcome many of the age-related obstacles that derail other golfers. This curve merely shows what we should expect out of the typical PGA Tour golfer. Very few golfers survive to have the type of career Davis Love III, Jim Furyk, or Phil Mickelson have had. That is a direct consequence of aging; a large number of golfers simply do not age well (whether due to injury, lack of commitment to practice, or general physical decline) and find themselves off the PGA Tour by age 40. Below is a graph of three golfers – two elite, top-ten-of-the-last-25-years types and one above-average player. It gives you an idea of how even very good golfers decline in driving distance. Greg Norman was one of the best golfers in the world in the 1980s-90s; he won 20 times on the PGA Tour and 14 times in Europe, largely by relying on his superior distance off the tee. 1983 was Norman’s first season on Tour with reliable driving distance data. That year at age 28 he out-drove the field by 19 yards – equal in performance to Bubba Watson and Dustin Johnson currently. Norman continued to out-drive the field by large margins, but his advantage fell to 14 yards (’87-’89, age 33), 13 yards (’92-’94, age 38), and finally 2 yards (’97-’99, age 43). Norman’s game couldn’t sustain the massive drop in driving distance and he declined from one of the best players on Tour in his late 30s to one who didn’t win a PGA/European Tour tournament after 1997 (age 42). He was only a part-time player from that point. Vijay Singh was a late-bloomer on Tour, not becoming a full-time member until 1993 when he was 30. He out-drove the field by 14 yards that season. Even at age 40 he out-drove the field by 16 yards as he rivaled Tiger Woods for the #1 ranking. 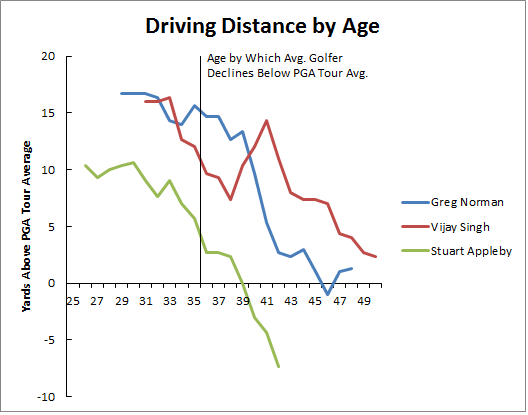 However, in 2013 and 2014 Singh has been exactly PGA Tour average at driving – a decline of ~15 yards over ten years; exactly what the aging curve predicts between 40 and 50. Stuart Appleby was a very good PGA Tour player by 2006, winning eight times and recording top 25 stroke averages in several seasons. He out-drove the field by 10 yards on average between ages 25-35 (1996-2006). However from 2006 onward he declined sharply, averaging only average driving performance between 2006 and 2013 – winning only a single tournament and basically being a non-factor on leaderboards. Driving distance is correlated strongly with performance. Mark Broadie’s work has shown that for every yard closer to the pin your tee shot lands, you save around 0.004 strokes. That looks small, but it suggests that the absolute best drivers are gaining roughly a 0.1 strokes/drive based on their distance. 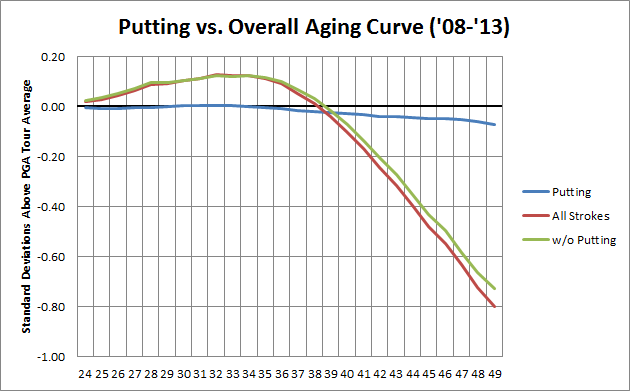 Applying the 0.004 figure to the above aging curve means we should expect a golfer to decline by 0.12 standard deviations between 25-35, another 0.12 standard deviations between 35-40, and twice that amount between 40-50. In all, a decline in driving distance explains roughly half of the decline in tee to green play. The component aging curve graph from above is reproduced with tee to green game separated into driving and non-driving shots (“Approach”). This shows that approach shots exist in a middle-ground between the largely power based driving strokes (which begin declining by 25) and the precision/technique based scrambling strokes (which never decline). This makes sense as iron/wedge shots with a full swing combine both power and precision elements. Really enjoy your analysis, hope there’s more to come.